The Popular Hallmark Ornaments, Star Trek! Growing up my dad would always watch Star Trek, so I watched it with him. I would imagine myself being on Star Trek and riding in the different ships and using the cool machines they had. Here are some of my favorites but you can look and find your favorites here. The crown jewel of most Hallmark ornament collections, as well as many Star Trek collections, the 1991 Starship Enterprise is one of the most sought after Hallmark Keepsake ornaments ever produced. Modeled after the U.S.S. Enterprise from the 1960s hit television show, Star Trek, this Hallmark Keepsake Ornament features red and green flashing lights and a bridge light that glows. The timing of the release of this ornament helped to commemorate the twenty fifth anniversary of the original Star Trek television series. When this famous starship was released by Hallmark in 1991, it was the hit of the season, and impossible to locate by most avid Star Trek fans as Hallmark stores across the country sold out almost instantly, making it a highly sought after ornament by Hallmark ornament and Star Trek collectors alike. The follow up to the 1991 Starship Enterpirse ornament, the Shuttlecraft Galileo Hallmark ornament was released in 1992, and was also a huge hit with Star Trek collectors. Not only did the cockpit of the NCC-1701/7 light up, but it also features a special holiday message from the First Officer of the USS Enterprise, Mr. Spock. To hear Spock’s message, “Shuttlecraft to Enterprise, Shuttlecraft to Enterprise. Spock here. Happy Holidays. Live long, and prosper,” press the button on the bottom of the shuttlecraft. In Star Trek when they go on missions that always take their Starfleet Tricorder with them. Press the button on the ornament to see the screen illuminate and hear dialogue from from the original “STAR TREK” television series! My dad has a tree dedicated all of his Star Trek and Star Wars Hallmark Keepsake Ornaments. It is such a cool tree! He has all of these ornaments on it and more. He just added the 2018 Hallmark Ornaments to it. He is going to need a new tree soon with all of those ornaments. Thankfully it is Friday!!! I am so excited for the weekend! We many fun activities to do for the holiday season. Do not get me wrong, we will still be working to make sure we get all of your orders out. We love our job! I hope you all have a great Friday! Star Trek and Star Wars: No Shortage of Cool Hallmark Collectibles This Year! Star Wars and Star Trek Hallmarks ornaments are some of the most popular ornaments during the holiday season. New ornaments have been released every year since 1997 and continue to grow in popularity. Here are a few of the most desired Star Wars and Star Trek ornaments for this year. This unique Hallmark Ornament features an exciting scene with Han Solo. The ornament illuminates and plays dialogue from the scene when the button is pressed. This magic 2018 Hallmark ornament is a must-have for any Star Wars fan. This 2018 Hallmark ornament depicts C-3PO wearing a Santa hat. It has light and sound features that require batteries, which are included. If you press the button, the ornament lights up and plays Christmas messages from C-3PO. Add this festive ornament to your collection just in time for the holidays. This tree skirt is nothing less than magical and deserves to be added to your Star Wars collection. The tree skirt is made of fabric and requires the Hallmark Keepsake Power Cord, which is sold separately. Once you plug the tree skirt into the Hallmark Keepsake Power Cord, you will be able to see its continuous light. This is another great piece to add to your collection as you prepare for the holidays. This Hallmark ornament features Lando Calrissian and Lobot from the film Star Wars: The Empire Strikes Back. This special two-pack set was revealed at the San Diego Comic-Con this year. Hallmark only produced 2,975 of this rare ornament, so get it now while you still can. 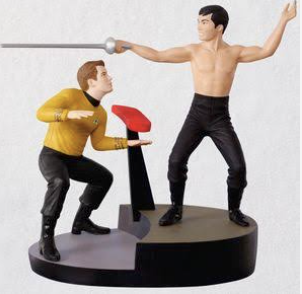 This fun ornament features a bare-chested Hikaru Sulu challenging Captain Kirk with a fencing foil. With the push of a button, it also plays the dialog from this unforgettable scene. The ornament comes with batteries, so you can enjoy its fun straight out of the box. This Keepsake ornament set features Lieutenant Arex and Lieutenant M’Ress as they are in the animated Star Trek series. This set was also revealed at the 2018 San Diego Comic-Con, and there’s only 2,800 of them in existence. This is a rare one, so get it before it’s too late. This year is an especially great one for Star Wars and Star Trek fans. If you’re looking for a new ornament to add to your collection, Hallmark is sure to have just the ornament for you. To find the perfect Star Trek or Star Wars ornaments for your tree this holiday season check out the options online. If you are a Trekkie, or you have someone on your Christmas list who is, now is an excellent time to add to your collection. The Star Trek Hallmark ornaments collection began in 1991 and has been going strong ever since. The first Star Trek ornament was the 1991 Starship Enterprise Hallmark Ornament. In 2010, due to the popularity of the Star Trek line, Hallmark started the Star Trek Legends series, which began with Captain James T. Kirk as the headliner first in the series. Those Trekkie fans who can’t get enough have been waiting with baited breath to find out what the new releases for 2018 will be. The word is finally out. The 2018 collection will add six more ornaments to the mix. This year, Hallmark has even added one from the Star Trek animated series. In July of this year, Hallmark released the scene from “The Naked Time.” This fun ornament depicts a shirtless Sulu fencing Captain Kirk atop the Enterprise bridge. The ornament is a “magic” one and plays the dialogue from the movie, making it even more spectacular. Also, in July, the Starfleet tricorder was revealed from the Original Series. It too is a magic ornament that lights up and plays the original Trek dialogue. The third release in July was the Crossfield-class DSS Discovery, announced and anticipated since September 2017. Lastly, the Constitution-class USS Enterprise was a throwback from the original Hallmark ornament first released in 1991. It is the seventh TOS-Era Enterprise Hallmark ornament. Over the years, Hallmark wanted to make something super special for Star Trek, and decided to reserve a few of the Star Trek Hallmark ornaments as convention-only exclusives. For 2018, the ornament will feature the 45th-anniversary commemoration of Star Trek: The Animated Series. It is a two-pack ornament set that contains the alien crew member favorites from the show. Lt. Arex and Lt. M’Ress, the three-armed navigator, are the very first Star Trek Hallmark ornaments fashioned after the Animated Series. Since the Animated Series ornament set will only be available as convention exclusives and not in Hallmark stores, it will make them some of the rarest and most valuable items in your Star Trek ornament collection for years to come. If you can get your hands on one, you will have a very select piece. For the Star Trek fan, the wait is over. All six collectible Star Trek Hallmark ornaments have been revealed. Don’t miss out on adding to your collection this year. They are already in limited supply and going fast. Check out all the great Star Trek Hallmark ornaments available at hallmarkornaments.com today. I love the Star Trek tree my grandpa has. It has blue lights and many of the Star Trek Hallmark Ornaments on it. I hope he puts it up soon! Back to work here at The Ornament Factory. Lots of orders to pull and package for shipping. Thank you to all of you who have been placing orders. We appreciate all of our wonderful customers!